One organization that does an exceptional job building their brand and message through effective corporate communication is DOS EQUIS. Dos Equis has been brewed since 1900 and was developed by master brewer Wilhelm Haase who emigrated from his native, Germany, to Mexico and fused brewing traditions from both places to make a unique, blended beer. This brand has grown in popularity ever since, but has recently skyrocketed thanks to some effective marketing and advertising ploys. The “most interesting man in the world” campaign made its debut in 2006 and was designed by the marketing firm Euro RSCG for the Cuauhtémoc Moctezuma Brewery. The ads feature Jonathan Goldsmith as “the most interesting man” and are narrated by Frontlines Will Lyman. Rather than an embodiment of the brand, “The Most Interesting Man” is a voluntary brand spokesperson: he and Dos Equis share a point of view on life that it should be lived “interestingly”. According to the company, U.S. sales increased each year between 2006-2010 and tripled in Canada in 2008. Although exact figures were not provided, sales of Dos Equis have increased by 22% at a time when sale of other imported beer fell 4% in the U.S. This campaign changed their identity from a mere beer brewing company to a revolutionary product; thanks to the endorsement from one of the most accomplished men on the planet. Not only is the endorsement a golden ticket for the company, but their advertisements have also proven to be successful. The ads are surrounded with catchy quotes, including: “He is the life of parties he has never attended” and “Sharks Have a week dedicated to him” as ways to connect with common themes that the audience will recognize. Goldsmith recently said in an interview that he realized how successful the campaign had been when a man came up to him in a restaurant, telling him that he had asked his young son what he wanted to be when he grew up, and the boy replied, “I want to be The Most Interesting Man In The World”. Dos Equis is a great example of how effective marketing can be. I remember one time my mother, who isn’t the most attuned to television or technology, called me to ask what type of beer I would like her to buy. My roommate and I answered Dos Equis and she asked if we were the most interesting men in the world. If a beer marketing campaign can affect my mom like this, the company must be reaching everyone. The commercials and campaign are simple, creative and catchy; thus, doing a great job selling imported beer. I too believe that Dos Equis is great example of how effective marketing can be. “The Most Interesting Man in the World” is also one of the best brands in the world of beer. It has been so successful that other companies have developed similar types of fictional characters to sell their beer. An example of this would be “Keith Stone” for the Keystone Light advertisements. He is a character that is always smooth when handling any situation, while advertising that the beer taste very smooth. 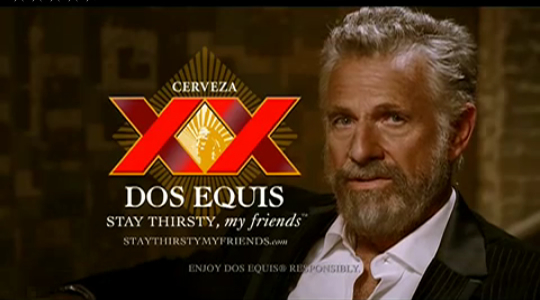 Personally, I think that “The Most Interesting Man” campaign is one of the best marketing campaigns out right now. It’s creative, funny, interesting, entertaining, and most importantly it makes you remember the name “Dos Equis.” I had never really heard too much about Dos Equis before the campaign and now I feel like it’s a mexican beer that is as popular as Corona, if not more so. I remember the first time seeing one of these commercials and just thinking that it was a really entertaining but now that I look back at it, I really do agree that the whole campaign is marketing gold. This campaign is definitely one of the more catchy and clever campaigns yet! It is quite funny, which adds a lot to a commercial and any campaign for that matter. It is not meant to be a funny ad but rather one that instills a manly hood to the viewer. But to me, the seriousness makes me giggle because, well, it is just beer. Nevertheless, it is a successful campaign that makes the brand name stick in your head. Well done, but I wouldn’t expect less from the most interesting man in the world.